When someone decides that they want to become a Guardian of the Herland Forest, usually the next step is for them to spend time on the land and find a spot that feels right for them. Some prefer the burial park feeling of the eastern third of the Herland Forest, while others prefer the more dense middle third. Margaret is a long term friend. Over the years, she’s attended multiple events that have been held in the private campground next to Herland Forest. So, when she decided to become a Guardian, she was alreadyfamiliar with Herland Forest and the ecological niche it’s nestled in. So, on a recent trip to visit family, Margaret and her partner stopped over to camp. While they were here, Margaret picked out her spot among the ancient oaks that make up the western third of Herland Forest. Once the Guardian has selected the location they want, the next step is to dig the grave. In the spring, when the winter moisture is in the ground, that’s straight forward. 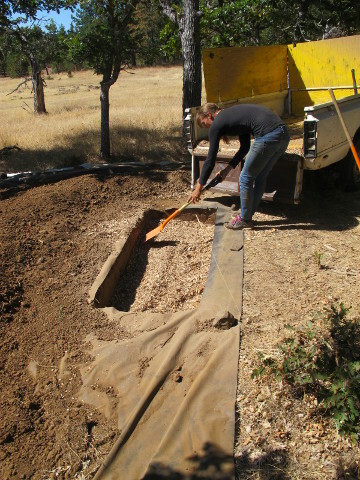 But in late summer, the ground is dry and hard, so the technique we use is to add water to the hole to soften the dirt. Then the next day, we excavate another few inches, add more water, and repeat as needed until we reach the desired depth of two and a half feet. It’s not a fast process, but it keeps us from needing to bring in heavy equipment when the ground is dry. If we were dealing with a situation in which the burial needed to be accomplished within 24 hours, as is the custom with certain cultures, we would crank up the backhoe and do whatever was necessary to accommodate. But when circumstances allow, we take our time and work with nature. 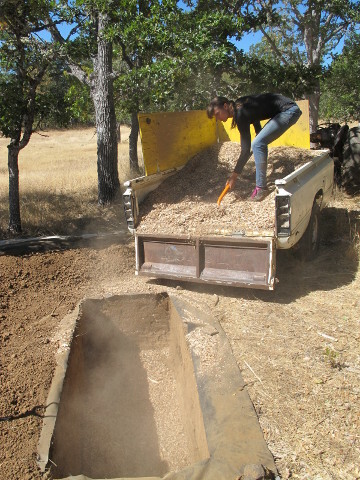 Once the grave is dug, the next step is to fill it back in with wood chips. One of the reasons we do this is to make sure that a grave can be quickly opened and made ready to receive a Guardian’s remains regardless of when they pass. Another reason is that the buried wood chips will store rain and snow melt that will be sought out and utilized by the surrounding oaks. That deep moisture will then support the growth of that bit of the forest, as well as the bouquet of daffodils that will mark the grave (and keep the ground squirrels at bay). 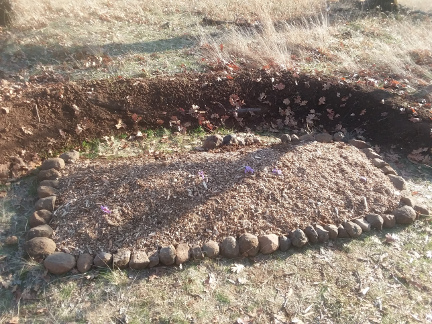 We hope that it will be years before Margaret will have need of this grave; in the meantime, the wood chips will ensure that the grave will start helping the trees to flourish. Here on the eastern side of the Cascade mountains, a reliable access to water is the key to the viability of an ecosystem; the cache of wood chips will help smooth out the annual water cycle for this cluster of oaks. The next step then is to fill the grave with two feet of wood chips. 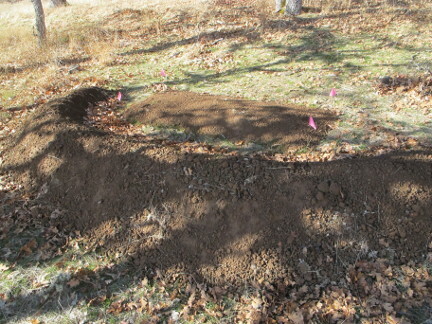 Then, when it comes time for the grave to be used, the wood chips will ensure a quick and easy grave opening even if the ground is seasonally dry or the surface is frozen. The health of any forest depends in key part on the subterranean mycological network that connects the trees. The surface of the forest debris we process to produce the chips contains the spores of the fungus that, over time, will digest the wood and liberate the micronutrients it contains. Then, the fungus will transport those crucially important atoms of magnesium, calcium, phosphorus, boron, etc. to the trees and trade them for xylose, the form of sugar that trees produce. This “underground economy” is vital to the health of the forest, and by chipping up the forest waste now, the fungus will have lots of time to spread throughout the chips and become fully established. Then when remains are added, the mycological system will be primed and ready. The wood chips are then capped with a foot of dirt to initially seal the grave. The remaining dirt is then used to create a berm just downhill to retain run-off from the snow melt or an especially hard rain. 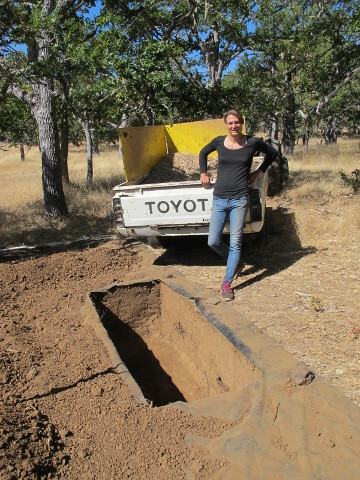 This water retention feature will allow the grave to support the forest by helping retain water that will help support the adjacent trees through the late summer dry season. That’s important because it’s the combination of warm weather and adequate water that enables a tree to grow strong and fast–less water means less growth. 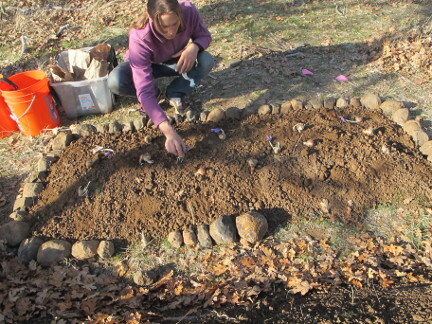 The next step in preparing a grave involves planting dozens of daffodils. 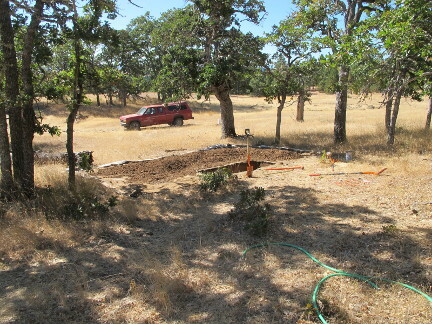 Over time, they’ll serve the dual purposes of keeping the ground squirrels from moving in, and protecting the roots of the tree that will eventually be planted here. 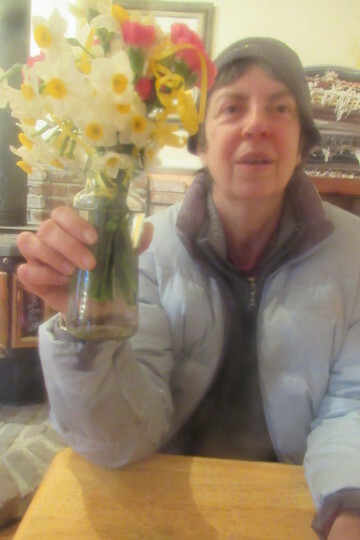 And over time, this practice increases our stock of daffodil bulbs, thereby helping to bring more beauty to the Herland Forest. From an aesthetic point of view, we like the idea of turning each grave into a bouquet of spring time flowers. There’s something marvelous about seeing daffodils signaling the end of winter and the arrival of spring. After planting standard daffodils around the perimeter of the graves, one way we mark the graves that have been chosen in advance is by planting some exotic daffodils and golden saffron in the center of the unoccupied grave. When it’s time to use the grave, these bulbs will be dug up and replanted elsewhere. But until then, they’ll grow, reproduce and celebrate the coming of spring to the Herland Forest. 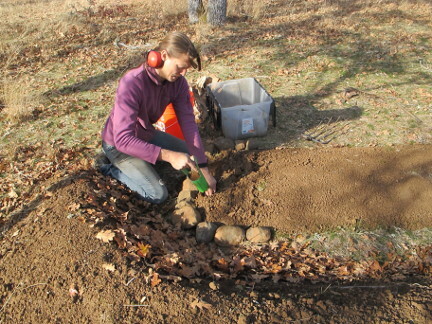 Wrapping up, we define the outer border of the grave with rocks, and then cover the ground with an inch or two of wood chips to prove a covering mulch that will help the grave retain moisture. That wraps up our process for preparing a site that the Guardian has chosen. We hope you’ve enjoyed this walk-through of Herland’s approach to creating a form of natural burial that is designed to celebrate life.